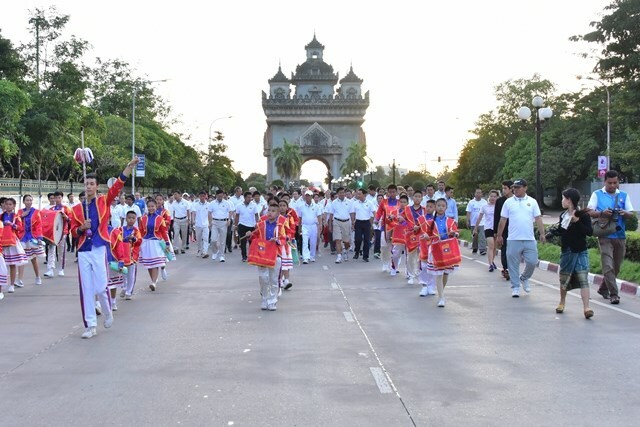 Vientiane (VNA) – Lao senior officials and diplomats from ASEAN nations took part in a mini-marathon at Patuxay Park in Vientiane, Laos on August 12 as part of a series of local events to mark the 50th ASEAN anniversary and the 20th year since Laos became a member of the bloc. The annual mini-marathon was chaired by Lao Minister of Foreign Affairs Saleumxay Kommasith with Prime Minister Thongloun Sisoulith in attendance. In his remarks opening the event, Foreign Minister Saleumxay Kommasith lauded the significance of ASEAN and its achievements over the last 50 years. “ASEAN looks forward with excitement to the next 50 years and beyond of working hand in hand among Member States and with all external partners for peace, stability and prosperity of the ASEAN Community and the world at large”, he said. For Laos, throughout the past two decades of being part of the ASEAN, it has made important contributions to the grouping and has benefited from the ASEAN Community building process and partnership with all ASEAN external partners, the minister noted.